Alright guys and girls! Thought i'd make my own thread just so if anyones interested they can keep track on my return to the beautiful game! Started playing in goal when i was about 10...used to play in defence but after the keeper got sent off i got put in goal and loved it!! and i've never looked back! Played all through my teens and just enjoyed the game! never really thought about taking it pro or going to a coach..which is a shame really! if only i knew then what i know now haha! Started playing 5 a-side when i left and back into goalkeeping! getting consecutive promotions on a tuesday night league! I then broke my middle finger, shattering the top bone and snapping the tendon...(mallet finger)...so i was out for a few months until it healed! SO.. Last night was my first time back in goal since my finger has healed..and my first time in an 11 a-side goal for a number of years! !...and to make matters just that little bit worse...its a trial and its on Sandy astroturf!!! So a little bit of a recipe for disaster concerning my finger but i put that little bit of fear to the back of my mind and manned up!! Got on with it and showed them my stuff! We did a little bit of fitness training and so skills work and set pieces too and then moved onto an hour long training match to see how the new guys worked together! We won 4-1...which i was really chuffed about! Made some good catch saves from crosses and long balls and also saved a few 1v1's as well!..we had good communication and i was owning that defence...bit of a sore throat this morning!! I was also mega disapointed with my distribution as my goal kicks were poor to be frank...and some of my drop kicks just swerved away from where i was aiming! so definatly something to work on! But the main point is that i did enough to impress the gaffer and he's agreed to sign me up to the team!! so im looking to train as much as possible to improve my general fitness and strength and hopefully in a real competitive game i'll do ok!! Sorry for the "speech"...i get carried away! Nice review. i am pretty much in the same position as you in many ways except for the damaged finger (Work in high secure services, been out for a number of years, play 5-aside being promoted every season). This is my first season back in 11-aside, very excited but anxious aswell. i am overweight so i need to shift a few pounds, but my reflexes are still there which is good. My distribution is also a fail so needs alot of work. Alright mate! Great to hear you getting back to keeping 11-a-side. Not a bad opening result either. I'm sure the stuff you learned as a kid will come back to you and you'll find it more and more natural. Best of luck! Big news today is that ive been named as number one keeper for the team!! so i must have done alright indeed! and also i've been asked to play for the works 11 a side team too!! so busy busy busy for me!! So my hope of easing back in to the game have gone out the window! i just hope that i can stay injury free and get on with it! Its sink or swim time methinks!! My finger is a little swollen after a knock on weds when i saved a 1vs1 and collided with the player but im sure it'll be ok! its just getting my finger used to being knocked and used after months in a splint! S1rus - Ha we do sound very similar indeed! how have you tried to improve your distribution? practice practice practice im guessing? Shuyin - I'll be keeping regular updates on this! i think i've got a lot of room for improvement! as my dad always said...confident..but not cocky! Shefellover93 - Cheers mate! i hope it does! i think its just confidence building and pre match nerves to sort out! Got a friendly vs a new team called Tate coming up...game from sunday has been moved so not playing this weekend! nice relaxing break...but i'll see if i can get onto the east of england showground...(live next to it) with a ball and start blasting it! Cheers for the comments guys! i'll try and keep it interesting! ice your finger! it'll help! :D keep the confidence and form going mate! Well chugged!! Woke up this morning And my finger is not swollen and feels perfect :-) hasn't felt this good in a long while! So really looking forward to training on weds! Cheers for the comments again guys! I've read all the other goalies threads! And I hope this is inspiring as they are! Really helps confidence as before you just think..."crap! It's just me that's nervous as hell!" I'm well chuffed!!!! Not chugged! I'm not drunk! Haha damn iPhone! Been well busy at work so haven't had a chance to update this!...plus as a blackburn fan anything football related Pi**es me right off!! damn venkys! Last weds found out our official date for the first friendly is at home to Tate on Sep 11th! so big day not only for me but the team too!! In the last training session i was put up against a constant attack as we did defence vs attack drills and also corner kicks! I played pretty well and the manager was very happy with my performance as i only had 4 go by me all night!! 2 were just stupid unlucky!! we were doing corner drills and i punched a ball clear but it hit a jumping defender on the back of his head some how and flew back in! ...its funny now that i look back! and the second one was an own goal when the same defender stuck his foot out to block a shot after i screamed "mine" and it deflected over to the other side of the net! ...Idiot!! As you can guess...he will be on the bench for that game! makes me worry about how we'll be in a game situation towards the final minutes...will i be left for dead again?? My kicking has vastly improved!! just need to work on the dropkicks and i'll be happy! Training again tomorow! i think i'll need to speak to the gaffer about the defence situation! Anyone else had experience with being left for dead by the defence? Just started to read this thread, congrats on the come back. Yeah i guess your right! Loads of times people have said...Oh why didn't you do this or that...but its just a simple comeback of...if you'd have done your defensive job in the first place it wouldn't have even happened haha! Anyways small update!! Got training tonite but i've been informed we have a training match on sunday at our home ground! so everyone is fully up for it to try and impress the gaffer!! so better be on my toes for this one!! Look into tape for your finger and, if you wish, fingersave gloves. I, on matches, use tape on my thumb and wrists - the feeling of support is great. As for being left dead by the defence - scream at those motherf*ckers. Shout and let every defender know where they should be and what to do. Tell them to drop back or whatever. Well an update after my first 11 a side training match this weekend!! Turned up to the home ground with what can only be described as a bundle of nerves,excitement and cheerios!..om nom nom..pre game chow! Its only spitting when we get there and the wind isn't to strong so im thinking this could be a good game! !..The pitch isn't that huge so im confident that my kicking will look a bit better than it is haha! 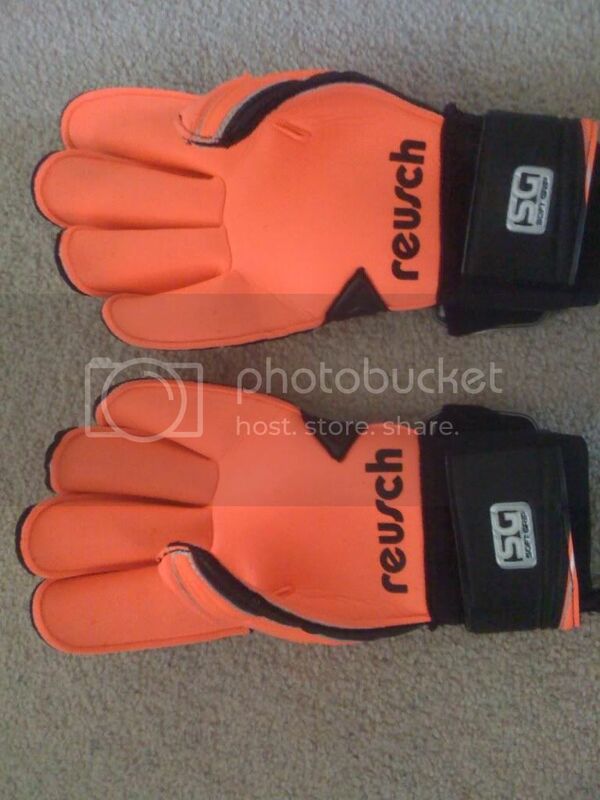 Also my new Reusch gloves turned up which are bright orange! gave them a good pre wash and they feel great!...although im given a bright yellow goalie top and look a bit like a marshmellow/air traffic controller! The other keeper is our new reserve keeper, hes a big lad and very down on fitness but used to be in goal for deeping rangers who are a pretty good team in the area!...so no pressure! Im told that as we are down a couple of players, the manager is putting a strongest 11 against the rest...and im in goal for the rest to see how i do..nice! So my back 4 is actually a back 3..which includes a midfielder who loves to go forward!! so i would say more of a back 2!! My nice box which wasnt too soft has turned into a full swimming pool with 2" of sitting water...and the rain is so thick i can only see silhouettes running about on the halfway line! !...so i cant even tell how the other keeper is getting on! The other training team start pumping up long balls..and if you can imagine an orange blob appearing mid air out of no where and not even bouncing..just landing outside the area every 2 mins...you'll get an idea of the conditions!! My gloves having to be "Squeezed" to get rid of half a bucket of water ever couple of mins and im sure i weigh an extra 20 pounds from water soaked up! But just 2 mins before the break it happens!!.. a corner is conceded and is swung into the box and is cleared right to our star striker! He smashes the ball hard and low and im about to get to it when it take a nasty deflection and flys off back to the right! 1-0 to them!...im a bit annoyed but take it on the chin anyways...how could i help that? With no let up in the rain and the other half being more of a marsh than pitch...we're thinking it may be time to call off the game!..the players could barely run due to quickmud conditions but we kept trooping on! Lets just say that the last 20 mins my team were no where...3 had gone off the pitch "injured" and the remaining 6 had no chance!! After the game all the lads are really supportive which is a good sign of the team...rather than the usual..keeper gets the blame!! and the gaffer says that he's picking me for the first league game this sunday as i played well...even though i didn't feel i did...and that the conditions will be so much better and everything will be different with 11 men in front of me!! but writing this makes you realise...i didn't stand a hope in hell even if i was playing my best!!! Pros from the performance - Distribution is sooo much better! !..my goal kicks were really good and my 1v1s couldn't have been better! Cons...Fitness... Working in that rain with those muddy conditions really tired me out and by the end of the game i was shattered! !...extreme as they were i felt i could be fitter! Confidence...letting my head drop! after 3-4 goals i was ok..but when further ones went in i was quite low!! 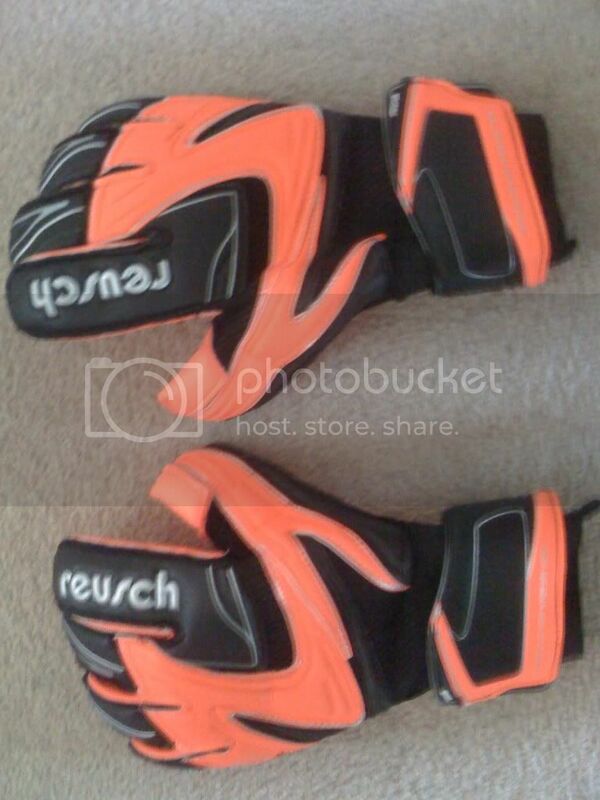 Heres a pic of my new bright orange reusch gloves!! Cant review them yet after one use...but even in the monsoon conditions i was able to keep hold of everything i could get my hands on! quick update, had training last night and it was a sensational practice!! made some epic saves and really impressed the team especially the manager! So hopefully i'll get the text tonite to say i've been picked for sundays game ahead of the reserve keeper!! Well chuffed with my performance!! mega confidence boost!! Well haven't been on here for a while as been mega busy with work but i've got an update after my first game of the season and only my second time between the big sticks in 7 years! Played another new team called TAIT at home on an incredibly windy day! 60mph gusts according to the news! !, these winds were blowing across the pitch! So goal kicks were fun, with the ball getting a few feet in the air then the wind took the ball 20 ft to the left! I literally had to aim at the side line to try and get it anywhere near the center spot!! Anyways it wasn't a good game for us and we lost 4-0! 2 of there goals were 1vs1's and i tried my best but to no avail! the other two were wind assisted flukes that even their manager said on any other day wouldn't have gone near the goal! The first goal they had a player cross the ball from the corner of the box...the ball was going to no one but the wind floated it to the top corner...i was gutted to concede my first goal...i didn't even move for it thats how much it curled! The Third goal was a free kick...the ball flew into the area into the wind...i should have kept my eye on the ball but i was being shoved from my left! Our team were shocking though and we were being attacked left right and center! i made a few diving saves and was comfortable with long balls being pumped in so it wasnt an overly bad performance but i feel that if the defence were more solid and weren't running up the pitch so much i may not have been so exposed! Training this week i was really good and i was happy with my performance so hopefully this sunday we'll be a lot better and i can try and claim my first clean sheet!! i'll do a review of my Reusch gloves soon!...not impressed that after two games they are fraying a lot on the fingertips!! Its all over already!! well a big setback! sooo broke my 5th meta and im out for a few months!